“James Bonnet’s Stealing Fire from the Gods is a must for every creative writer. Even for experienced authors, screenwriters and creative thinkers, James has a unique way of revealing the skeletal structure of the story you wish to write, and even more, revealing the essential lineaments of what Joseph Campbell called “The Monomyth,” the essential archetypal story of human struggle and fulfillment that can be understood by any child or adult, and from whatever culture. James Bonnet’s commitment to the same underlying principles of creative visioning and writing has matured and developed for over for thirty years–which marks him as a master. Or if you prefer, think of him as a Promethean wizard whose fire-theft has been so successful, it can boil any number of cauldrons of inspiration – including your own. “Bonnet’s rich feast for the soul is mirrored in detail by Cynthia and David Price’s Franche Comte hospitality, where every day sees fresh local produce combined with effortless grace and art for say a petit dejeuner – not to mention sumptuous Cordon Bleu caliber repasts with plenty of good wine at the end of a long day of visioning. 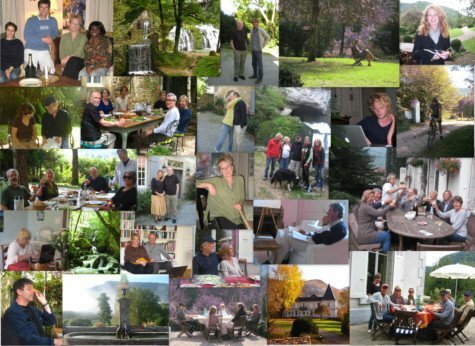 “James Bonnet’s Storymaking Workshop Retreat in Nans Sous Sainte-Anne introduced me to an approach that I have used in everything I have written since: Travel essays, short stories, poems, a film script, and in-depth outlines and chapters for two historical novels. The group gathered there developed a bond we have continued to nurture ever since, with ongoing creative communication, collaborations, and travels together. “As our group met again in Santa Monica for another workshop, James’ process continued to become integrated into my approach to become the natural way I write. Consideration of the hidden structures in all great stories has allowed for more depth, meaning, and clarity to emerge in my own writing. Mindfully shaping my stories to reveal the transformation of larger entities has allowed me to write in a way that highlights hidden psychological metaphors, points to bigger truths than just my topic, and resonates with a wider audience. “James’ utter respect and encouragement of my own creative unconscious has led me to trust my intuition in a way that has proven invaluable to me. In my own teaching experience in Paris earlier this year I used Stealing Fire From the Gods extensively to help other writers develop their own intuitive process and gain confidence in their own creativity. James’ advice about following one’s fascination and attending to even negative intuitive feelings resonated with the writers and helped them create incredible stories. Erin Byrne is an award winning writer, most recently for 2012 Travelers’ Tales Grand Prize Silver Solas Award for Spirals, Memoir of a Celtic Soul. She has been a guest instructor for the Evening Writing Workshop at Shakespeare and Company Bookstore in Paris, and is co-editor of Vignettes & Postcards, an anthology of writings from this workshop. “Not only does Jim have a profound understanding of story (see his book, Stealing Fire from the Gods) but he can apply it to a writer’s work to identify what’s working and what’s not working in their story. In my case, he saw the source of a big problem in my novel that had been bothering me for more than a year and he showed me how to fix it. It was a transformative moment for me, the scales fell from my eyes and at long last, my story really worked. I could see and feel how energy could be transformed as it flowed through my story. “I have spent many years studying novel writing – including completing an MA in creative writing – and ‘story’ was a word that rarely came up. I therefore learned to write without understanding story. It was only very late in the process of writing my first novel that I realized that I had this fundamental gap in my knowledge. “I think about the gift you have given to me in your wisdom and encouragement. You have discovered the secrets of the depths, the way to travel with the tidal forces in our souls. You have enabled us to navigate toward our own unique expressions of Universal Consciousness.